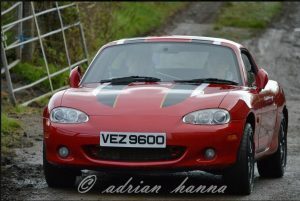 Damien Mooney made it two wins in a row at the Ballynahinch Autumn Lanes Targa Rally. A massive 28 seconds was his lead at the end. 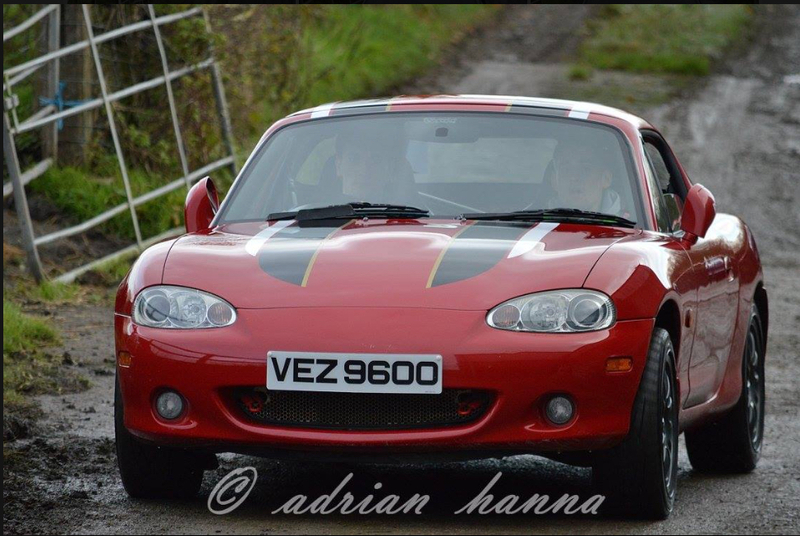 Damien Mooney and his navigator Tony Anderson pulled off a totally dominant performance at the Ballynahinch Autumn Lanes Targa Rally on 11th November. Driving his usual Citroen Saxo, he set the fastest time on the first test and then led the event all the way to the finish line. 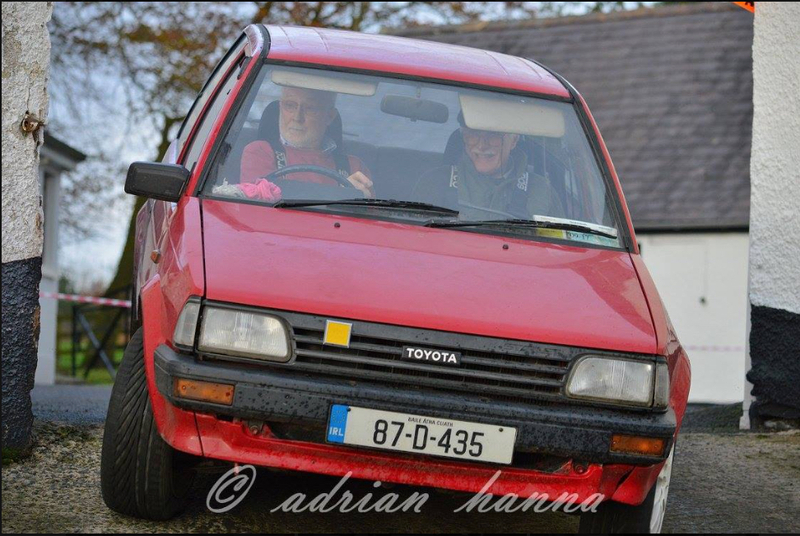 There would be a couple of early challengers for the win, with both Eamonn Byrne / Joanna Lenehan in a Toyota Starlet, and Kyle and Francis Adair in an MX5 drawing level with Mooney on Test 3, but neither could match the pace of the Coagh driver. Byrne would hang on the longest, holding second place overall until the fourteenth test where a drive shaft decided it had had enough and became two separate pieces. The penalty for failing to complete that test would push the Wicklow team down to seventh place, and that would be their final position. 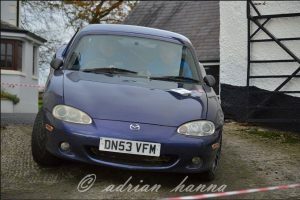 Douglas Reid and Sam McAllister would benefit from Byrne’s misfortune to take a fine second place overall in their MX5, just ahead of Matthew Mason and Will Corry’s flying Nissan Micra. 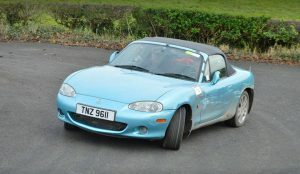 Just two seconds adrift in fourth place was David Crothers and Barbara Kane in their MX5. Douglas Reid set top three times on ten of the fifteen tests to take a superb second place overall. Navigator was Sam McAllister. Local Dungannon crews had mixed fortunes on the day. Normally running in amongst the leaders, Eric Patterson and Raymond Donaldson were finding the going tough, and to add insult to injury, collected a Fail penalty on Test 5 while running just inside the top ten. Sixteenth overall would be the best they could manage this time. Stewartstown’s Trevor Ferguson, partnered with David McElroy, sent most of the day just outside the top ten overall and would eventually finish eleventh in their MX5. Meanwhile, Norman Ferguson and Brendan Mooney would take nineteenth overall, just one place ahead of David Burns and Conor Murphy in a Ford Fiesta. 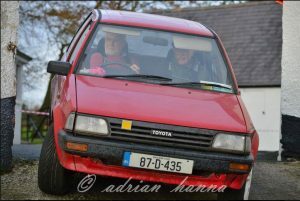 Showing some signs of contact, Eric and Suzanne McIvor came out winners of the Beginner RWD Class with a relatively clean and smooth performance. The local success story of the event was the performance by Eric and Suzanne McIvor. Having only recently tried his hand at Targa rallying, he has steadily improved in speed and consistency and took the Class 6 win for beginners. This Father-Daughter team pipped Tim and Quinton Crean by ten seconds and ended up in twenty-fifth place overall out of seventy-five competitors. All but ten crews completed the event. The penultimate test was cancelled due to failing light, but it didn’t matter to the flying Mooney. He was fastest on ten of the day’s fifteen tests and ended up with a lead of 28 seconds. As if to emphasise how dominant Mooney’s victory was, the next nine crews would be covered by the next 28 seconds. Stewartstown’s Trevor Ferguson and David McIlroy took fourth place in Class 2.